Hello there. 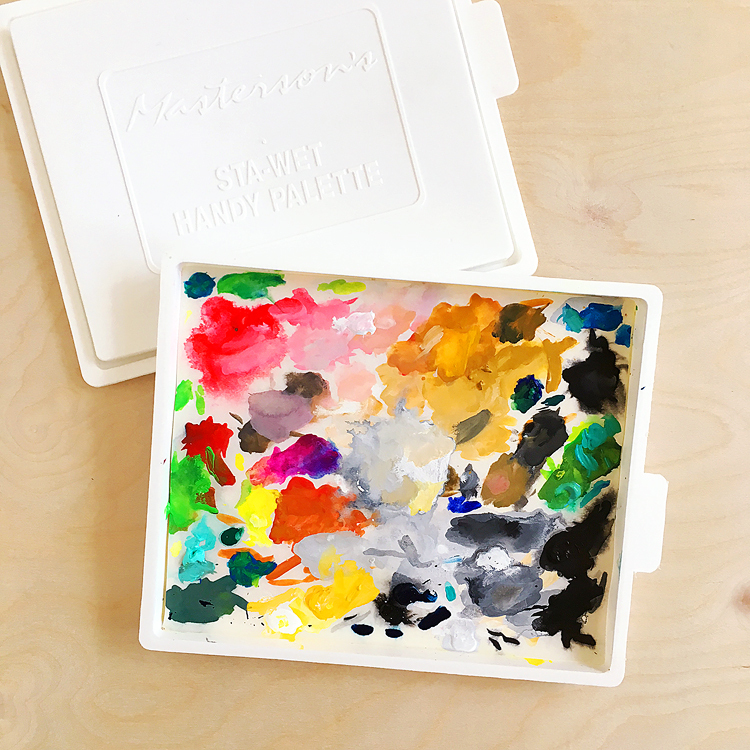 Welcome to my little stop on the hop featuring all of these NEW early Spring Simon Says Stamp products! There are so many awesome stamps and dies, I could hardly wait to get them in my hot little hands. With 14 designers and all of these products, I can’t wait to see what everyone shares on today’s hop. Oh and there’s a GIVEAWAY too — more on that later. First, the cards! I have to say, I love ALL the new release stamps and dies. Truly. But I couldn’t seem to stop using the new Full Card Triangles die. Just. Love. It. It’s pretty much my favorite. 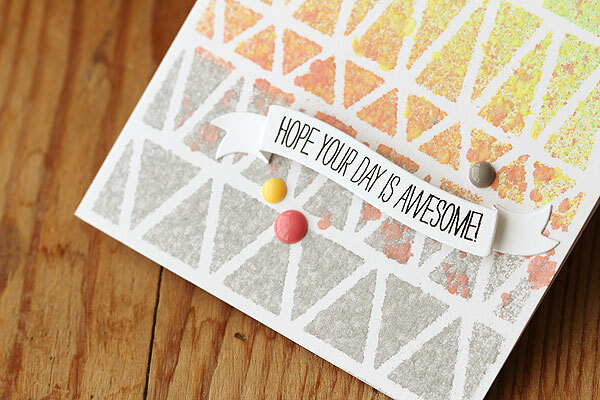 You’ll be seeing it on all four cards for today — yep, told ya I couldn’t stop using it! Got a little carried away and didn’t have time to play with the envelope set or the cute critters in the circle set. Darn it. 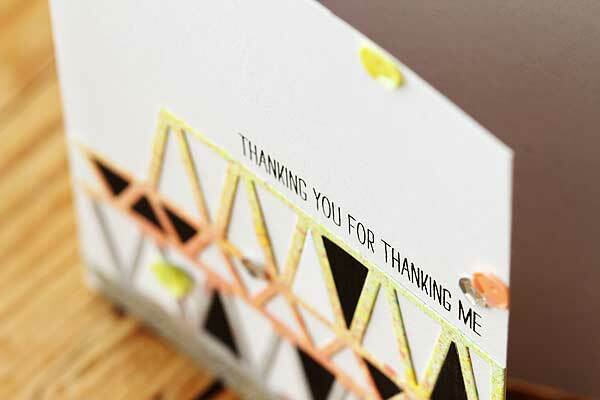 I kept all the cards in my current fave color combo: mint, peach, yellow, gray and touches of silver or gold — or both! 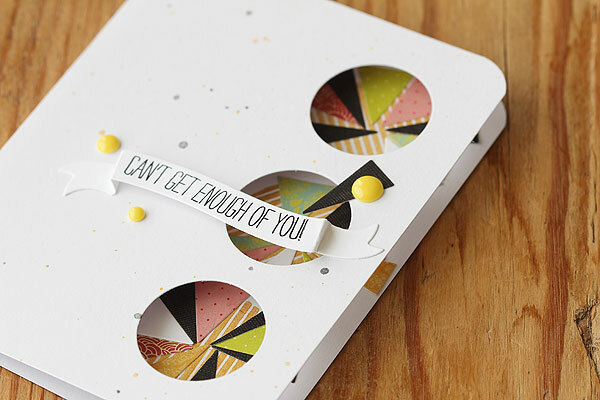 I started off by cutting a piece out of white cardstock and using it as a mask and misting it (see below for all the supplies), then I added some enamel dots and one of the new banner banners and sentiments from the All Occasion Banner dies set. This message? I frequently say “no, thank YOU” when people thank me. So now I can make an official card. Love it. This card also features some of my other current obsessions: sequins, metallics, and glitter tape. Did you know that glitter tape existed? Woo yah, pretty and sparkly but no fuss and no muss. Gotta love that! The sequins are from my stash, but you can find some similar ones in the links below. And those black triangles? Well, they’re cut from some awesome paper in the BasicGrey Kneehighs 6×6 pad. 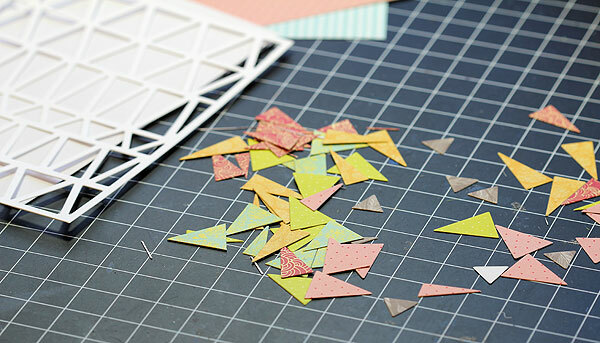 I cut them out along with some triangles using the Studio Calico Sundrifter pad — it’s another current obsession. I’m on my third one now ha ha! 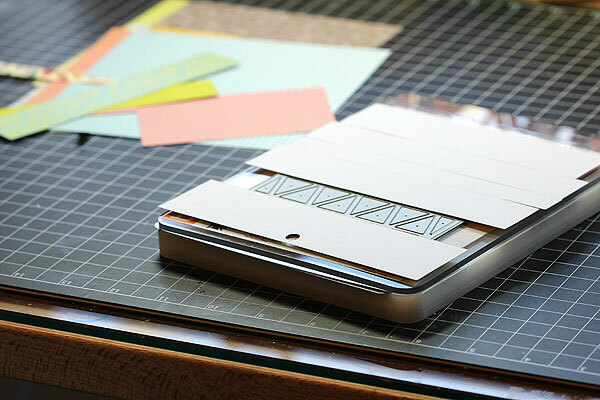 Here’s a little trick for cutting out different colors: just lay strips of papers across the die, making sure that it will fit through your machine. I trimmed off a little from an end just to be sure that it wouldn’t catch. This is a great way to use up your scraps! And how did I use them, you may ask? Why to make pie charts! And one arrow. First, I splattered silver and gold mist on the front of a white notecard and let it dry. Then I used the new Tri Circle Die to make a the windows. Which was filled with pie charts under each window. Loving the pie chart trend right now. Maybe it’s the math nerd in me, ha. Last but not least, the card that took me the longest! This card was waaaay out of my comfort zone because I wanted to make it a little messy. Hello there, love. You messy card you. That’s it for my cards. Can’t wait to play with this die some more! I’ve got plans to make some triangle shaped flowers and some arrows, too. If you encounter a broken link or would like to go to the start of the blog hop then head on over to the Simon Says Stamp blog. Update! 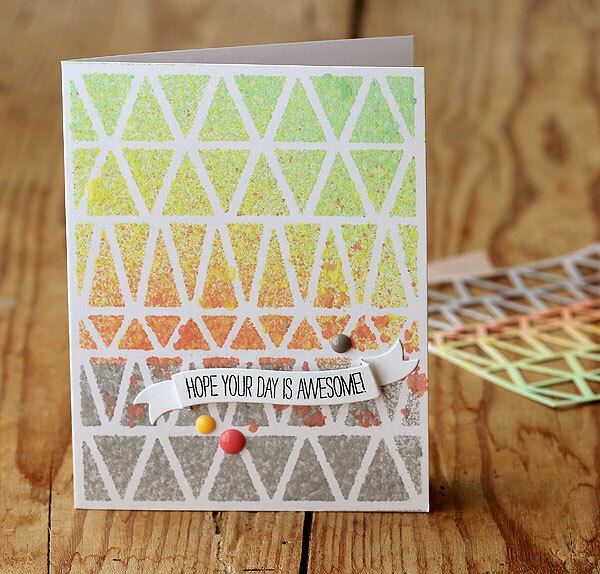 Thank you to all of you who stopped by my blog for the Simon Says Stamp 2013 Spring release blog hop. I hope you had as much fun hopping as we had creating the projects for you. We had 14 designers participating and some made more than one project! 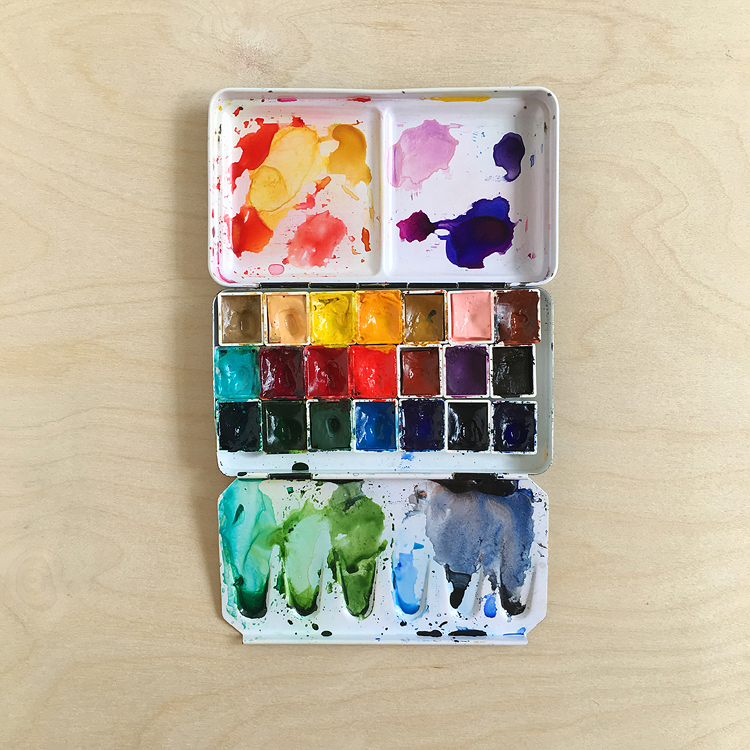 So there was lots of great inspiration and you can still take a look here. If you haven’t had a chance to check out the new stamp and die sets stop by the Simon Says Stamp store here to see them all. Jana Millen from Simon Says Stamp will be in contact with you to get your mailing address so we can get your prize off to you. 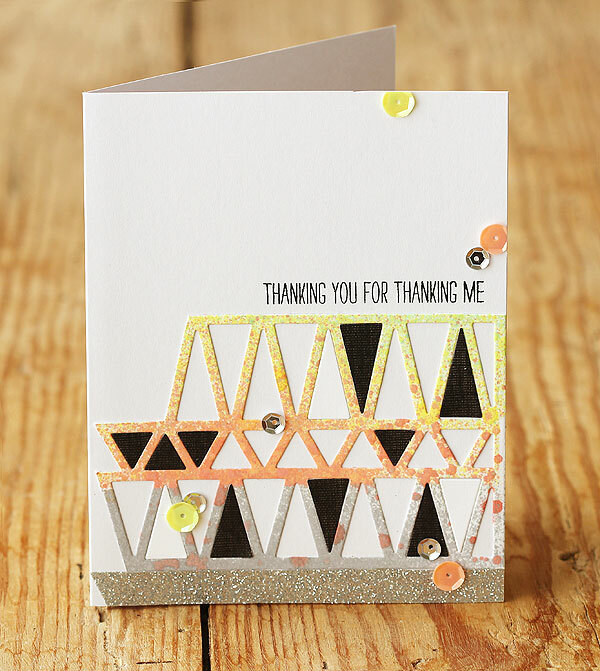 Great cards – love how you used parts that might have just been thrown away. Thanks for the inspiration ! Thanks for sharing your awesome projects! Great tip for cutting! love the third card’s design..really creative!! Thanks so much for the chance to win. I absolutely LOVE that “hello there” card. It’s gorgeous. Yep, I’m lovin’ those triangles too! Can’t wait to get it! Thanks for sharing these neat cards! Fab and fun cards as always, Lisa! My SSS wish list is getting longer and longer! Especially Love the first misted card! 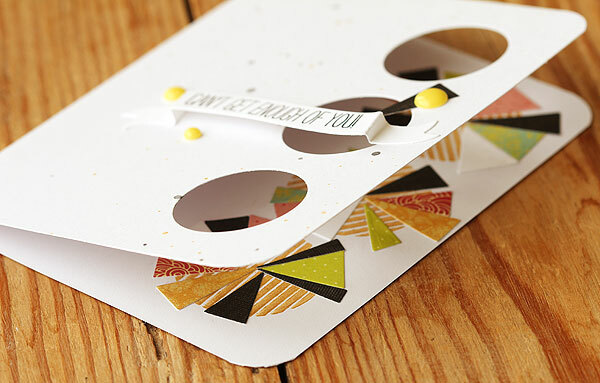 Awesome way to use the mask from your die cut. TFS! 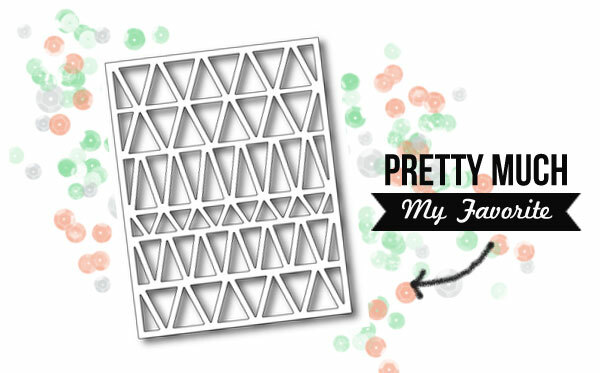 I love your pie chart ideas to use the triangle pieces from the die. Amazing work!! 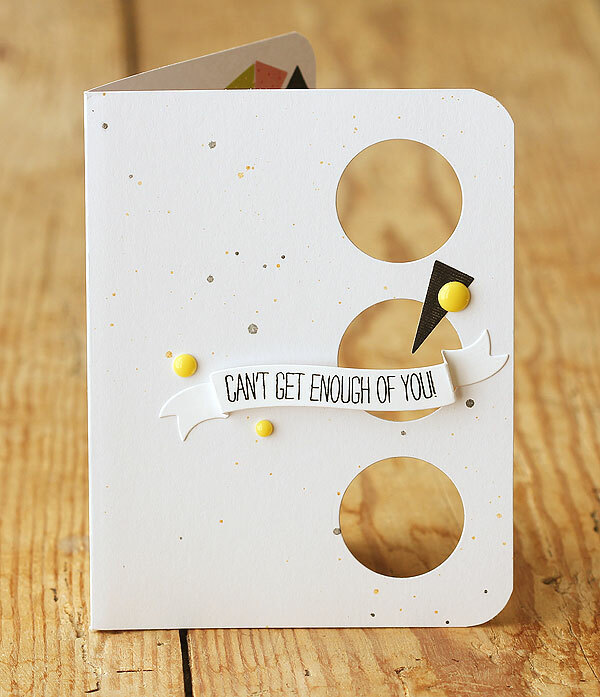 love your creations, especially the cannt get enough of you card. love the layering inside the card and seen thru the cutouts. thanks for sharing and chance to win.